Line cookie sheet with waxed paper. In medium saucepan, melt candy coating over low heat, stirring constantly. For each Rudolph, dip rice cake in candy coating; place on waxed paper-lined cookie sheet. 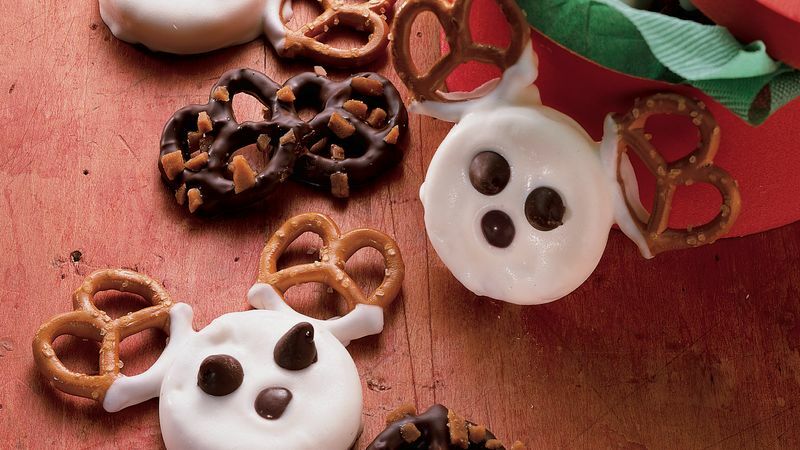 Dip rounded side of 2 pretzels in candy coating; place on cookie sheet on each side of rice cake to resemble antlers. Decorate with chocolate chips for eyes and cinnamon candy for nose. Let stand 15 minutes or until set. Carefully remove from waxed paper; store in tightly covered container.